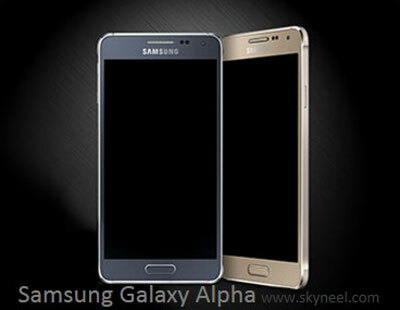 Samsung Announced its new Smartphone phone Samsung Galaxy Alpha. Samsung Galaxy Alpha has lots of RAM 2GB and lots of storage capacity 32GB inbuilt. Samsung launches its new Samsung Galaxy Alpha Different Processor Variations like as Cortex-A15 Quad-core 1.8 GHz & Cortex-A7 quad-core 1.3 GHz. Samsung Galaxy Alpha has touch Displays offer a more interactive experience. It has Slimmer phone. Samsung Galaxy Alpha has faster CPU means more smooth experience.it has a high resolution camera for taking sharp and clean photos. Samsung Galaxy Alpha is a Smartphone phone which is available in dual SIM with 4G facility in Different Color Variations like as white, Black, blue, silver and gold. This phone uses different chipsets for different variants in 4G versions with Cortex-A15 Quad-core 1.8 GHz & Cortex-A7 quad-core 1.3 GHz Exynos 5 Octa 5430 processors. It has 12 MP with LED flash, auto focus facility on the rear and 2.1 MP front camera. Samsung Galaxy Alpha Powered by Cortex-A15 1.8 GHz Quad-core & Cortex-A7 quad-core 1.3 GHz processor With Mali-T628 MP6 GPU. The Galaxy Alpha has Exynos 5 Octa 5430 Chipset. Samsung Galaxy Alpha has 2GB RAM With 32GB Rom and user can’t be expand Memory. The Galaxy Alpha has 4.7 inches Screen. It has IPS LCD capacitive touchscreen Display with 720×1280 pixels Resolution. Its screen can display 16 million colors. The Galaxy Alpha has 12 MP Rear Camera with 4128 x 3096 pixels and 2MP front Camera. The Galaxy Alpha is a stylish phone, it has 132.4 x 65.5 x 6.7 mm Dimension and weight is 115g. The Galaxy Alpha runs on Android OS, KitKat 4.4.2. It supports Java and browser flash. The Smartphone has a compass, Accelerometer, proximity and Maps, Calendar, Google Search, Gmail, YouTube, Google Talk, Alarm, Calculator, Clock, and other Google sync apps. This is power pack with loaded lots of features and apps. The Galaxy Alpha has supported 4G, 3G and 2G (GSM) networks, Bluetooth, GPS, NFC and Micro USB with Li-Ion 1860 mAh battery. 1. It has lots of RAM 2GB. 2. It has Latest Android OS, v4.4.2 (KitKat). 3. It has a High Speed CPU. 4. It has Super AMOLED Screen.